We were ferried by tender boats to a small island near Samana in the Dominican Republic. We also spent some time relaxing on the ship. Having been ashore today, we're looking forward to some interesting visits to other islands during the rest of the cruise. Today was our first landfall in the Caribbean, at Samana on the south coast of a long peninsula in the north-east of the island. After breakfast we decided to visit the town of Samana and then transfer later to Cayo Levantado where there's a tourist beach. But we changed our minds, instead staying aboard the ship and relaxing with a good read, having a light lunch in the Garden Restaurant, and then getting the tender to the Cayo. 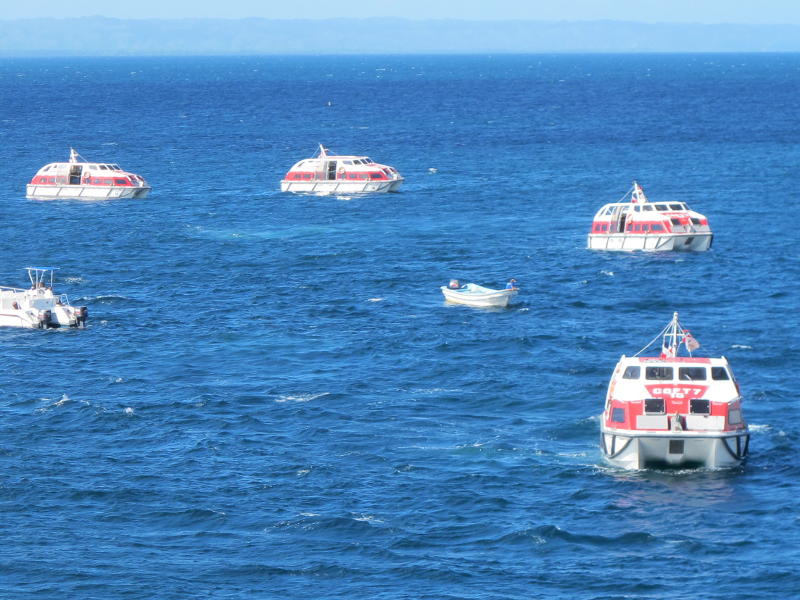 By all accounts there wouldn't have been much to see in Samana and the crossing was longer in quite choppy conditions. The tender boats are the ship's lifeboats and it was interesting to travel in one. There is no deep water harbour at Cayo Levantado, and the ship has a deployable landing stage to make it really easy to board small boats. The lifeboat dropped us at a jetty right by the sandy beach. We found ourselves in an area of public parkland with shady trees, paved walkways, and a range of stalls and open air bars and little restaurants. 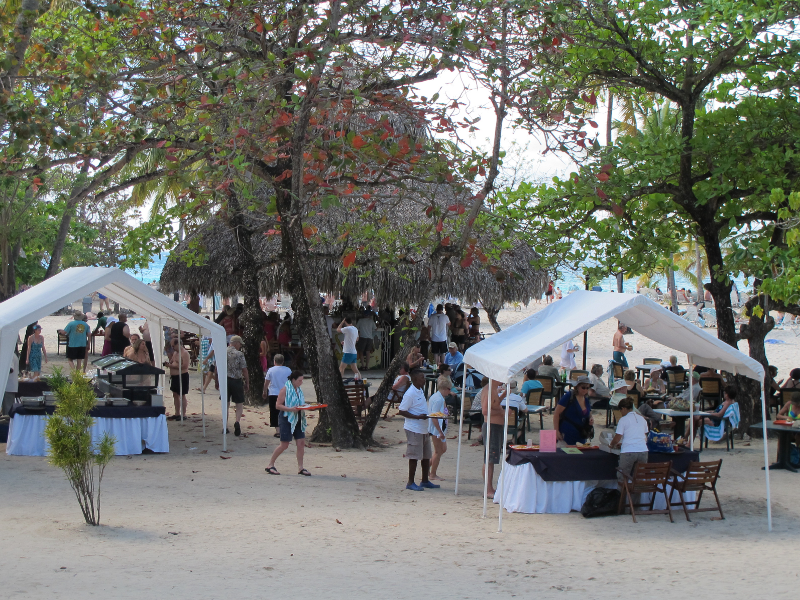 We stopped for a refreshing drink and checked out the stalls, some selling artwork, others with T-shirts or hats, and some with gifts and local crafts. 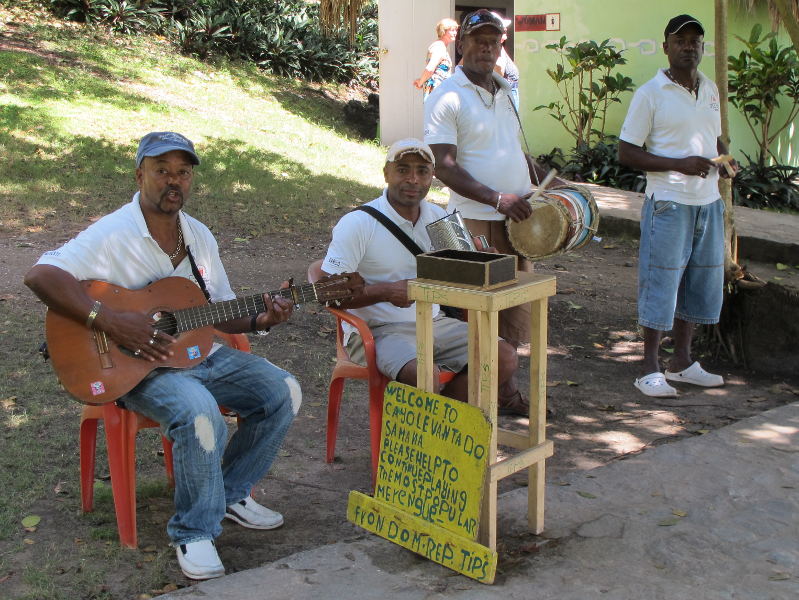 There was a band playing local Dominican music, they were very willing to pose for a photo in exchange for a small gift in their collecting box. 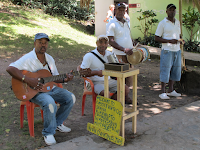 The Dominican Republic is mostly quite poor and I think the band members and the stallholders are much better off than the folk on the mainland, particularly away from resort areas. After exploring, we found a shady spot on a grassy bank right by the sandy beach and spent some more time reading. I'm going through Jonathan Aitken's excellent book 'John Newton' on Donna's Kindle, while she's reading Jim Palmer's 'Divine Nobodies' on mine. Back on board the ship in the late afternoon we headed out of the bay and Donna got a good look at some humpback whales as we passed from bay to open ocean. This is the same population we saw on our trip to Boston a few years ago. All I saw were waterspouts, but Donna might have caught a glimpse of a whale or two as well. We've decided we really like the freestyle dining experience, and I'm enjoying the informal dress.